“I had checked my wife’s set up as usual pre-dive. The pressure gauge was showing 190 bar on the surface. I had a habit of checking on Anna frequently because she was still quite new to diving. A few minutes into the dive, I saw her hovering away from the reef in mid water, sensed something was wrong and swam towards her. She gave me a wide-eyed look and pointed at her regulator. I glanced at her gauge and saw it was at zero so I gave her my octopus and we went up together. It seems incredible that a standard size scuba cylinder should be so full of water that a diver would only get a few minutes of air. Some might interpret the story simply as a mistake or a misunderstanding on the part of a new diver with a supportive husband. However, when I heard the story, it brought to mind something that I came across when I ran my dive store in Guam a few years ago. We used to conduct annual visual inspections on cylinders owned by local residents and were surprised to often find a few centimetres of water in the bottom of the cylinder. This was always fresh water, not seawater. We made some enquiries and found that this is fairly common and comes from the almost universal practice in dive stores around the world of filling scuba cylinders while they are standing in a bucket or a trough of water. The fill whips, hoses that are clamped onto the valves of scuba cylinders to fill them, sometimes drop into the water trough between cylinder fills. When they are then attached to the valve of the next cylinder and the airflow is turned on, the pressure of the air in the fill whip is higher than the pressure of the air in the cylinder and the water droplets are driven into the cylinder. Fill the cylinder several times and the amount of water inside accumulates until you have little pools forming in the bottom. The moisture inside causes corrosion inside the cylinder, too. Bear in mind that we were in Guam, part of the United States where a stringent system of cylinder inspections applies and is enforced by dive operators. The maximum length of time between inspections is 12 months, so inside the cylinders we were opening, several centimetres of fresh water had built up in less than a year. In many places in the world where people dive, including the island nation where Anna’s dive took place, there are no regulations governing cylinder inspection, so it is not impossible that a cylinder could go for many years without anyone examining the interior. So apparently Anna’s story is not far-fetched after all. With her cylinder containing a large amount of fresh water, the volume of air in the cylinder was quite small, so once she started her dive, she used it up very quickly. The reading on her pressure gauge must have been dropping fast during those first few minutes of her dive, but she did not notice. All three of these reasons are the product of fuzzy thinking. 2. Using the fill bucket to wash the salt off the cylinder is ineffective as all that happens is that the water the cylinder stands becomes a little salty. A quick blast with a hose before the cylinder is taken into the compressor room does a much better job. 3. Aluminium cylinders have exploded during the filling process in the past, and when this happened, the consequences have often been fatal. However, an exploding cylinder is a bomb, and no plastic bucket or concrete trough is going to protect the person filling it. Instead, it might just contribute more shrapnel to the explosion. Having said this, those aluminium cylinders that exploded were made from a 6351 alloy containing lead, and it was the presence of lead in the alloy that created the problems that caused them to explode. Since 1988, no aluminium scuba cylinders have been made using this alloy or with any alloy containing lead. The vast majority of scuba cylinders in service today worldwide (including all cylinders made by Luxfer and Catalina—the top two manufacturers) are made from an alloy called 6061. Although during annual inspections, cracks have occasionally been found in 6061 cylinders, none has exploded—ever! And there are hundreds of millions out there. No need for a bath? It is worth noting here that not all dive centres that fill cylinders in water are ignorant, negligent and unsafe. There are many dive centres that do this but fully recognise the potential issues and take elaborate precautions to make sure the fill whips and cylinder valves stay dry during the process so that water does not get into their cylinders. 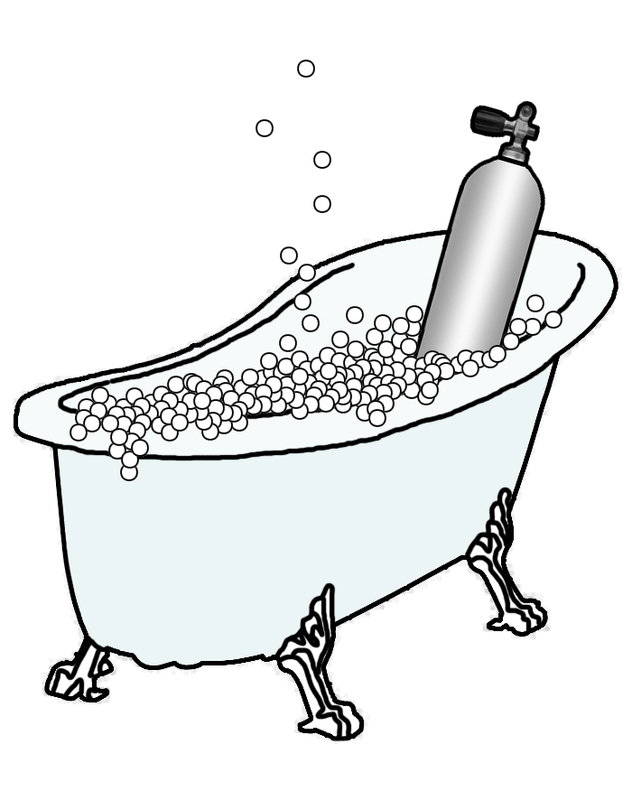 But if the likelihood that a scuba cylinder will explode during filling is so remote, if a water trough will not protect a filler if it does happen, if the water is not really an effective way of removing salt or reducing the cylinder’s temperature, and, crucially, if the practice of wet-filling can lead to an incident such as Anna’s, why do it at all? Simon Pridmore has been part of the scuba diving scene in Asia, Europe and the USA (well, Guam) for the past 20 years or so. His latest book, also called Scuba Confidential, is available in paperback and e-Book on Amazon. I was on my eighth or ninth dive, about five minutes in and at a depth of around 13 metres when I realized that my air was not coming out smoothly. I couldn’t think why this should be.